Red sheep hunting is a fantastic way to spend a few days out in the woods. These rugged creatures are truly worth the hunt. When you book one of V-Bharre’s Red sheep hunting packages you will witness the true beauty of this beast. Red sheep originated in countries that are hard to pronounce, Uzbekistan, Tajikistan, Kazakhstan, Turkmenistan, as well as in those countries with which we’re more familiar, Pakistan, Afghanistan, the Kashmir region of India and the mountains of northern Iran. In fact, it was during the reign of the Shah of Iran that the United States imported Red sheep from there. Known also as Urial, Arkar, or Shapo sheep, they are considered one of the most beautiful of all wild sheep. Red sheep have reddish-brown coats with a distinctive white and black saddle patch and a white underbelly. Rams have a black ruff that extends from under its neck down its chest. Dining on grass, brush and leaves, the Red sheep can weigh as much as 200 pounds with an average height of 3 feet at the shoulder. 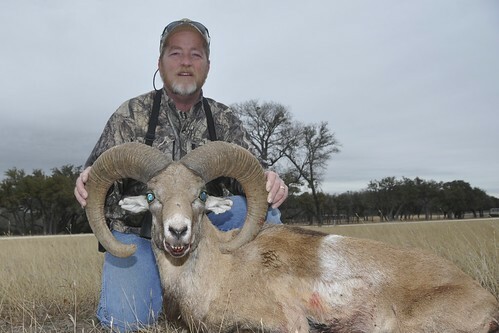 When you go Red sheep hunting in Texas, you’ll find their horns nothing short of magnificent. The ram’s large heavy horns curve outward from the top of the head, continuing behind the head and then back around to the sides of the head forming something like the letter “c.” The horns of the female are somewhat shorter and more compressed but great trophies nonetheless. Red sheep are just like any other sheep – they flock together. This helps them stay warm, but it also helps protect them from predators. They have a great sense of hearing and can run very fast when they sense danger. Red sheep will avoid walking in water or narrow openings. Given a choice, they prefer to move upwind and uphill, so you might want to consider that during red sheep hunting. Contact V-Bharre for more information on Red Sheep Hunting packages!